Scientists at the North Carolina State University have developed an innovative approach to fabricate more efficient plastic solar cells. This work could lead to development of solar cells with an increased efficiency and a wider absorption range. As plastic solar cells are now competing with silicon-based solar cells in power conversion efficiency, scientists want to increase the range of photonic energies absorbed by plastic solar cells. 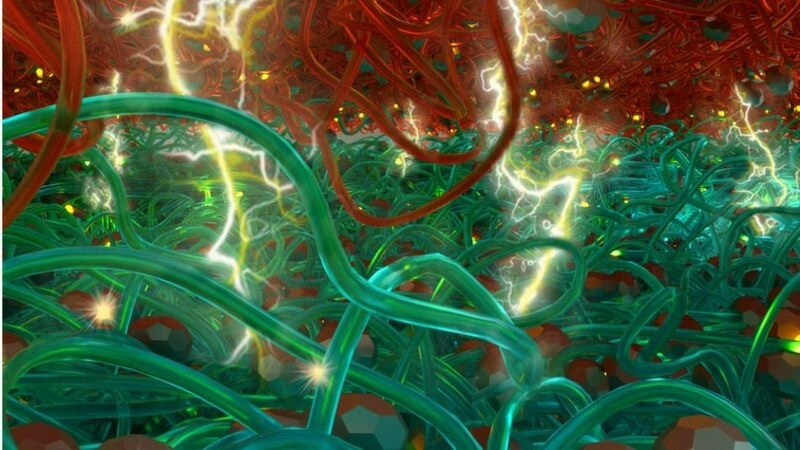 Ternary solar cells, where three materials are combined together as a light-harvesting layer, provide a promising solution. However, while ternary solar cells have been produced for years, most of the devices have not been able to meet the preferred levels of performance, often because of unfavorable mixing. Masoud Ghasemi, a graduate student in physics at NC State and lead author of a paper explaining the research, worked with a group of other NC State physicists headed by Harald Ade and chemists from the University of North Carolina at Chapel Hill headed by Wei You to find a solution for the production problem. The team suggested a calorimetric tool to examine the morphology of a ternary system with a fullerene acceptor and two absorption-matched donor polymers. When fabricated by the conventional method – which involves combining all three materials together and then depositing the materials onto a substrate – the system produced poor device performance. Using thermodynamic techniques, we were able to find that this particular mixture was undergoing ‘alloying,’ in which the donor polymers tend to group up together and push the fullerene away. This explains why so many conventionally produced ternary cells may have low efficiency. The research team decided to find a solution for the alloying problem by mixing the polymer individually with the fullerene, instead of mixing all three materials together at once. They produced two distinct mixtures that were layered onto the substrate, producing sequentially cast ternary (SeCaT) solar cells that are not affected by alloying. The SeCaT solar cells prevent the polymers from mixing due to their layered structure. This novel design allows fabrication of plastic solar cells with wider optical sensitivity using cheap and scalable processing steps and with reduced materials selection constraints. Hopefully this new method can be particularly useful for greenhouse applications toward zero energy farming, as the materials used to demonstrate our method have optical properties compatible to these applications. The work appears in Advanced Materials. Harald Ade, professor of physics at NC State, is corresponding author. NC State assistant research professor Abay Gadisa, postdoctoral scholars Long Ye, Joo-Hyun Kim and Omar Awartani, as well as UNC-CH postdoctoral scholar Liang Yan, graduate student Qianqian Zhang, and associate professor of chemistry Wei You, also contributed to the work. The research was funded by the Office of Naval Research grant N000141512322.